This newly revised 2008 edition remains the most comprehensive and technical handbook available, now covering even more of what the professional framer needs in a mounting manual. Twenty pages worth of information from the second edition have been condensed and edited, then sixteen new ones added for a total of thirty-six, making this a spectacular new 192 page edition. 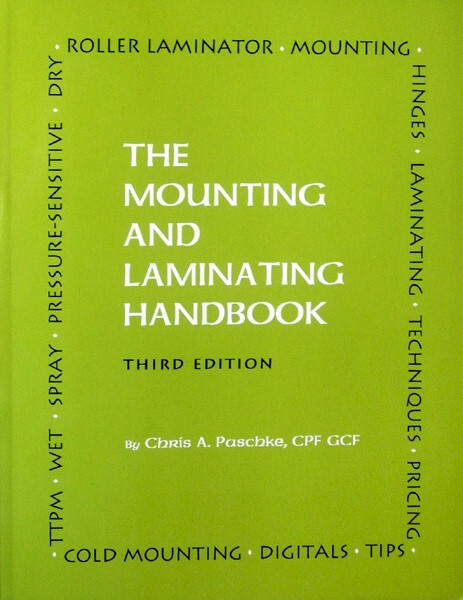 The familiar chapters of past editions are still there from the previous books including TTPM (time, temperature, pressure, moisture) for all mounting methods; adhesives and substrates; daily maintenance; step-by-step techniques; wet, spray, pressure-sensitive, and dry mounting. The newly expanded cold mounting and laminating chapters now cover starch hinges, kozo backing, encapsulation, sink mounting, face mounting, sponge mounting, linen backing, digital canvases, inkjet	receptor layers, and roller laminators. This edition absolutely belongs in every frame shop! It is required reading for the PPFA Certified Picture Framer exam. This 2008 THIRD EDITION release from Designs Ink Publishing, is a laminated, soft cover, 192 page edition, 7"x9", that retails for $24.95. Book is written in essay format, but includes bullet point step-by-step, line art, diagrams, special tips, detailed reference, contents and appendix, plus complete index and bibliography.